A Caribbean cruise can be a daunting vacation to pack for. Not only do you need beach attire, you also need outfits for days and evenings at sea plus any clothing necessary for certain shore excursions. Here are some tips on packing for a Caribbean cruise that won’t require having to bring three suitcases! Hiking Shoes: Pack low-top hiking shoes for outdoorsy shore excursions that can also double for a workout on board if you hit the gym, and which are comfortable to wear around a Caribbean port town while shopping and exploring. Dressy Sandals or Loafers: Bring a pair of sandals or loafers that look dressy enough for dinner in the on board specialty restaurants, but also are casual enough to wear around the ship during the day. Flip-Flops: Get easy to slip on shoes to stick in your day pack for beach excursions and to wear to the pool – or for a quick jaunt from your stateroom to get a coffee or other drink to enjoy on your verandah. Something that makes the Caribbean such a fun and memorable vacation is the huge variety of activities you can do while there. Islands differ on what they are known for (such as beaches, ziplining, rain forest hikes, architecture, and so much more) and even one single island can have wildly different things to do while in port. Cover your bases and any last minute shore excursions you might decide to sign up for once on board your ship by packing the right clothing. Here are some items you’ll want to make sure you have. Lightweight Raincoat or Poncho: The Caribbean is a tropical destination and part of what gives the destination its tropic beauty is rainfall, so you may encounter some on your vacation. It doesn’t have to ruin your day in port, though; most times of year rain in the Caribbean is sporadic and doesn’t last long. Be prepared with a rain jacket or poncho you can take out of your daypack and you’ll still be able to enjoy whatever activity you’re doing without worrying about getting all wet. Pants and Long Sleeves: If you’re going to be walking through rain forests or other wilderness areas in the Caribbean, bring breathable pants and a long sleeve shirt you won’t get too hot in, but which will keep you covered. This is ideal for areas you’re traveling in which may have mosquitoes or scratchy vegetation. Swimsuits: Bringing a swimsuit probably goes without saying for a Caribbean cruise, but what you might not think about is bringing different types of suits (ladies, this one is more for you). Definitely bring a suit that you want to lounge on the beach or by the pool in, and you also may want to stick in a swimsuit that you can be more active in. Think sports swimsuits that will let you comfortably snorkel, surf, go tubing down rivers, or any other adventurous water activity you may want to do in the Caribbean. Rashguard: Even if you’re not planning to try surfing or boogie boarding, sticking in a rashguard is wise since it will help protect your skin from the sun if you’re planning to be in the water a lot. The Caribbean sun may be much more powerful than what you’re used to and a painful sunburn is one quick way to ruin a vacation. Sunglasses: The Caribbean is sunny! Don’t spend your time in port squinting. Bring a pair of sunglasses (polarized sunglasses are best when you’re near water to help reduce glare) or a sun visor. • Ladies: Dress, slacks, blazers, jeans, scarves, skirts, casual tops — basically, whatever you’re comfortable in without being too casual. • Men: Pants or jeans and a sport shirt with sleeves. • Ladies: Cocktail dress or skirt/pants/designer jeans with an elegant top. Or get totally dressed up in an evening gown! • Men: Pants or designer jeans with a dress shirt, button-down shirt, or sweater. To get fancier, wear a blazer or sport coat over it. Pool Cover-Up: Bring something to throw on over your swimsuit for your walk from your stateroom to the pool and to put on if you take a break from relaxing by the pool to run to the Lido Bar. 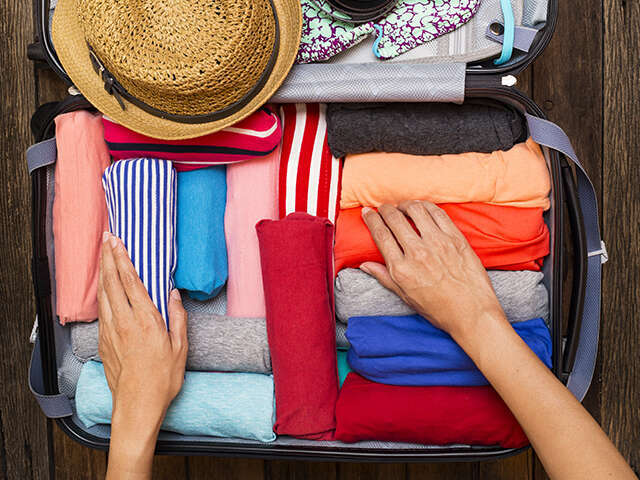 To round out the rest of your clothing for your trip, pack a few t-shirts or tanktops, cardigans or sweaters, a couple pairs of both shorts and pants or maxi skirts. You should be able to mix and match these to fit different weather and activities, whether in port or on the ship. Then get ready to enjoy an incredible Caribbean vacation!